Here’s a range report with a little twist. If you’ve been following our Facebook or Instagram posts, you may have noticed some teaser pics we’ve been posting of Australian Outback Ammo’s .223 55gr Sierra BlitzKings. 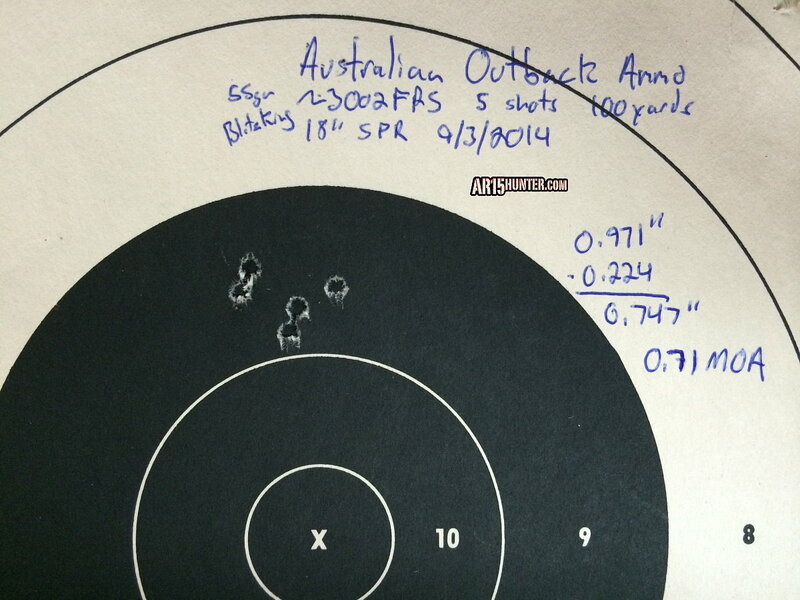 Australian Outback Ammo was kind enough to send us a case of ammo for testing, as well as to take on some hunts. 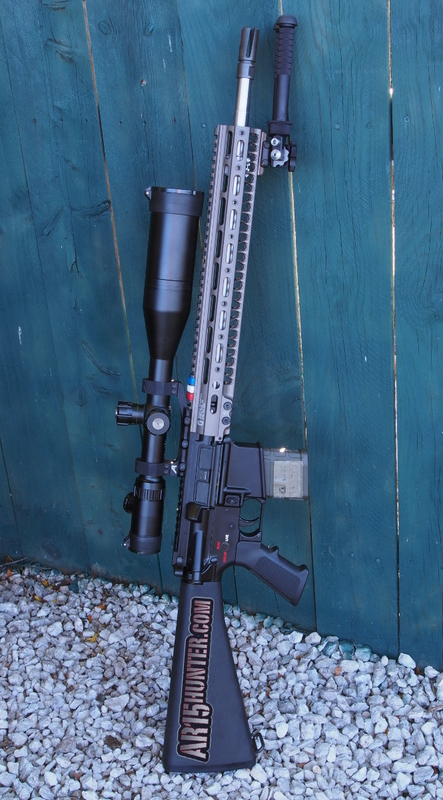 My rifle of choice for testing this newer ammo is my 18″ SPR, which is pretty much my go to AR for anything precision or hunting related. Last week I was able to get a short range session in, which allowed me to get a quick 50 yard zero with this ammo. Since I currently load my own 55gr Hornady V-max, I figured the Aussie rounds would impact relatively close to my POA (Point of Aim). I was right, and it took only a few tenths of a Mil in elevation and windage to get on the bull. Accuracy at my zero range looked very similar to what my personal V-max loads produce, which have been some of the most accurate loads out of this rifle. Yesterday the weather allowed for an extended range session, where I captured chronograph results and verified trajectory and accuracy at 100 yards. There was also a pleasant surprise, which I’ll touch on shortly. Australian Outback Ammo notes on their website that their rounds feature Ballistic Temperature Independence (aka BTI), this allows their ammunition to offer a very flat velocity curve under extreme temperature changes. Whether you’re hunting in the dead of winter, middle of the summer, or anywhere in between; velocity will be much more consistent compared to other premium ammo. In fact, for this particular load we are testing, they note a change of only 84FPS from 5°F up to 125°F. That’s about half the deviation than you typically see with some other premium ammunition. 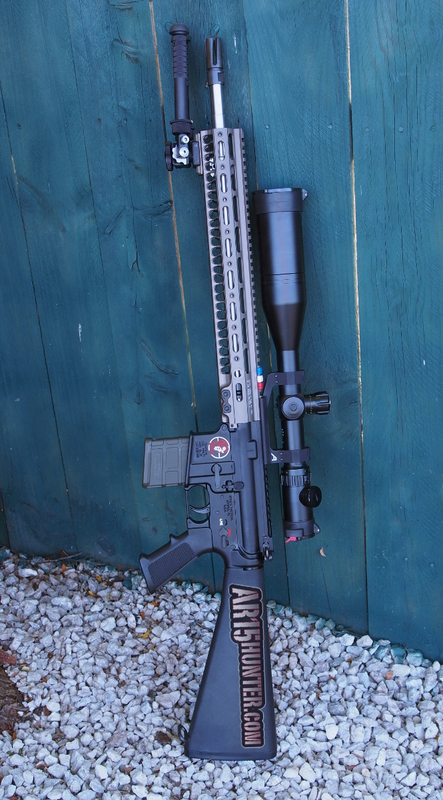 Not only does this consistent velocity help ensure your rifle is hitting where it should at a said distance, no matter what the temperature is, but it also helps reduce pressure spikes caused by changing weather conditions. This is something that is very appealing to hunters like myself, who may use the same load year round. At the range, I ran two ten round strings over my Shooting Chrony F1, and the average velocity was about 3002FPS. With each set, I fired subsequent shots with about a 2-3 breath pause. While our results are below the the claimed velocity of approx. 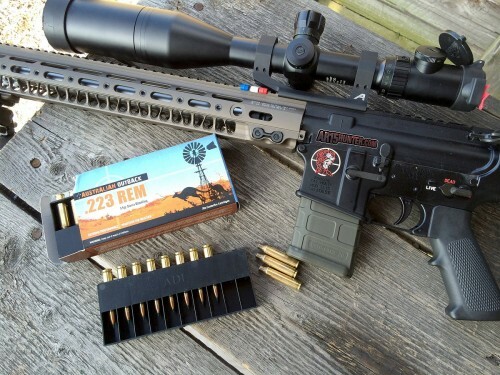 3200FPS, it’s important to note that I was shooting out of an 18″ barrel, versus the 22″ or 24″ barrel they probably used to measure the velocity of this ammunition. With my limited abilities, I was able to shoot right at or below 1MOA out to 100 yards. 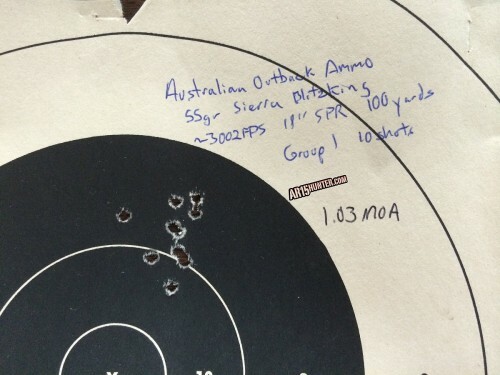 This was with 10-shot groups, with the above group measuring 1.03MOA at 100 yards. This is excellent for shooting small to large-sized game. Now for the twist in the story. 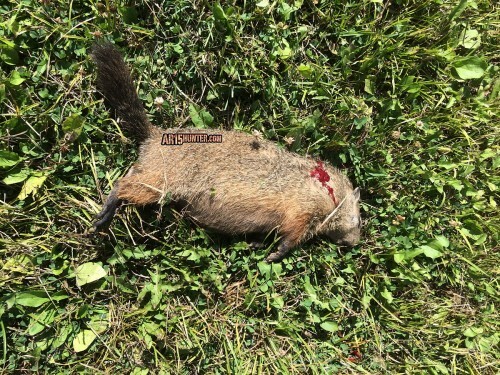 While getting the above results, to my shock, a four-legged critter decided to walk right out onto the field at our club’s 300 meter range. Yes, while shooting the second string during velocity testing, a nice fat whistle pig (aka ground hog) walked right behind my target stand! Talk about perfect timing. I was so excited I stopped shooting and started glassing to try and find him. After a couple minutes of looking, with no luck, I decided I needed to finish up this 10 round string. Once done, I immediately started glassing again, and about 20 minutes later Mr. Pig decided to take another stroll across the range. All excited, with my heart thumping like a V8 at 5000RPMs, I got him in my cross-hairs and slowly squeezed my Geissele trigger; MISS! I quickly gathered myself and calmed down, and took a second shot; HIT! At 205 yards, he was DRT (Dead Right There). When looking him over, there was almost no sign of an entrance wound. However, the exit wound was about the size of a quarter to half dollar. Being this was my first outing with Seirra’s 55gr BlitzKing, I was very impressed. And that my friends is the close of one of the best range trips I’ve ever had. Below are some photos of Mr. Pig posing with my rifle and Australian Outback’s ammo. 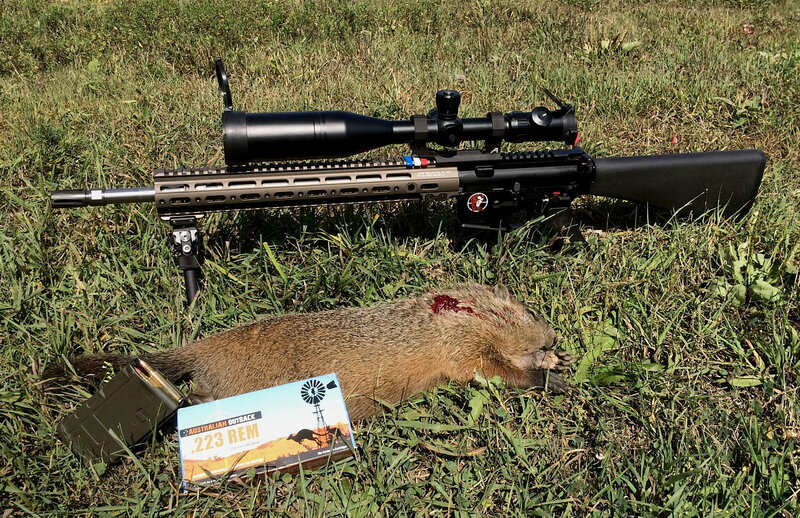 Stay tuned as we take this ammo and rifle combo with us out to Arizona next month for some prairie dog and coyote hunting. Update 09/03/2014: So, I ventured to my local range today to test some other products we have in for review, and I decided to shoot some more of the Australian Outback Ammo. With our Arizona trip coming up next week, I wanted to double check how the ammo and my rifle were shooting. I was able to post up the best 5-shot group to date with this ammo at 100 yards; 0.71MOA. It was good enough that I wanted to update this article with our findings. This ammo has continued to impress me, and I can’t wait to smoke some coyotes and prairie dogs out in Arizona. Will Chambers is a professional writer, product reviewer, editor, photographer, and webmaster, who also enjoys helping his beautiful wife run their small farm in Northern Ohio. As a certified CMP Master Instructor, he can be found at the local shooting range, directing monthly service rifle matches in his off time, as well as out in the woods chasing game. Hunting is a passion of his, which started when he was a small boy shooting his Crosman air rifle. Will hunts ground hog and deer regularly, and has expanded into predator, prairie dog, and has plans to hunt hog in the near future. His favorite tool of choice is an AR-15, and he's on a mission to teach the world that the AR platform is one of the greatest there is for hunting. His goal is to show that they are not just scary black rifles for military use; instead they are the most versatile hunting and shooting firearm available to today's modern sportsman and sportswoman.